The peripheral wavefront sensors (PWFS) vignette a large part of the GMOS science field. Furthermore, it has been found that there is significant flexure between GMOS and the PWFSs. At this time it is therefore recommended to use the on-instrument wavefront sensor for all GMOS observations with the exception of non-sidereal tracking, since the OIWFS implementation is purely electronic and limited to a small field of view. 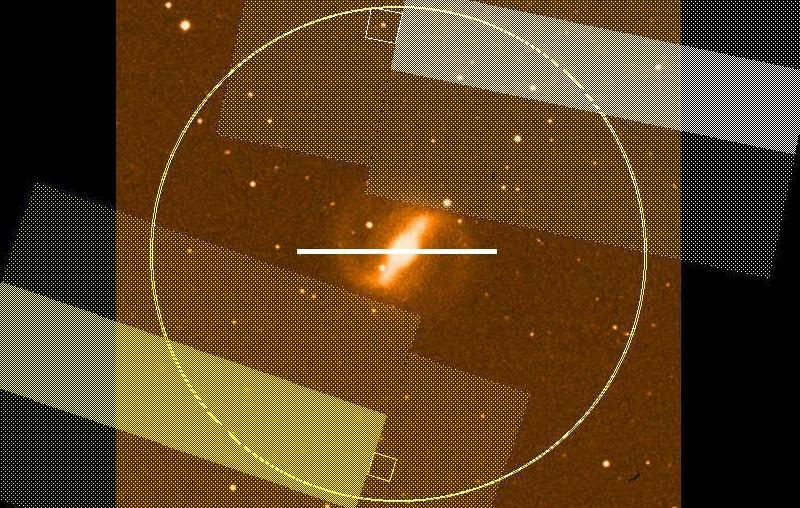 At a later time when the flexure between the PWFSs and GMOS has been modeled and can be corrected, the PWFSs may be used for all spectroscopic observations (though the vignetting of the GMOS field of view may limit the usefulness for MOS). Until then, GMOS spectroscopy guided with the PWFSs are restricted to non-sidereal targets, or targets for which it is impossible to reach a guide star with the OIWFS. Depending on the slit width, reacquisitions may be required every ~45 minutes as the target drifts off the slit due to flexure. The target is less likely to drift completely out of the IFU, though re-centering the target every 45 minutes is potentially still necessary. PIs should assume an additional 6 minutes of reacquisition time for every 45 minutes of GMOS spectroscopy when guiding with the PWFSs. Care must be taken to select guide stars such that the slit or IFU is not vignetted. An example of a set-up for long-slit spectroscopy is shown below. Schematic diagram showing the vignetting caused by the PWFSs. In this example the circle corresponds to the 7 arcmin outer radius of the PWFS patrol area. The white horizontal line in the center shows a GMOS long-slit. The large, shaded irregular boxes are the vignetting patterns of the two PWFSs; PWFS1 in the top of the image and PWFS2 in the bottom of the image. PWFS2 is not positioned on a star.